Seams? Wasn't that the topic of a post last summer? Why, yes it was! Since it's the number one question I get asked about sewing sweater knits, I think it deserves a quick revisit. Think of this post as “How to Smooth Sweater Knit Seams – Part 2”. The first real challenge many of my students face in the pattern making module of Introduction to Knitwear Design, a class I teach at Fashion Institute of Technology (F.I.T. ), is sewing a smooth seam, a seam that lies flat and doesn't ripple. The students spend the first six weeks of the class drafting various basic sweater slopers. Around the seventh week, students must actually begin cutting and sewing sweater fabrics, one of the necessary steps on the way to understanding the properties of the fabrics firsthand and creating their own designs. Though we start with the basics (stitching together simple squares of sweater knits), the stretch and (sometimes) slow recovery does take getting used to. This can be especially true for those who are very skilled at sewing woven fabrics. Learning to sew sweater knits means learning new skills and practicing. Fortunately, most people can get quite comfortable sewing a variety of knits in a couple of concentrated hours or less! While my F.I.T. students sew on industrial machines, domestic machines are usually very good with sewing sweater knits as well. I've discussed machine set up and special accessories before in several posts on this blog. This time I've collected everything into a printable roadmap for troubleshooting seams in a home sewing environment. On the roadmap (and it really is a roadmap) I've outlined the route I usually take with stops along the way. Feel free to skip some stops depending on your tools, or take another route entirely. Newsletter subscribers have already received links to this download. Others can download a copy by clicking below. Before you start a sweater project you need to figure out what settings work for your fabric in all the orientations it will be sewn. While it may seem like a lot of information, you can work through it methodically with fabric scraps. Once you've practiced and found the correct set up, you can proceed to sew your garment without seams that ripple. 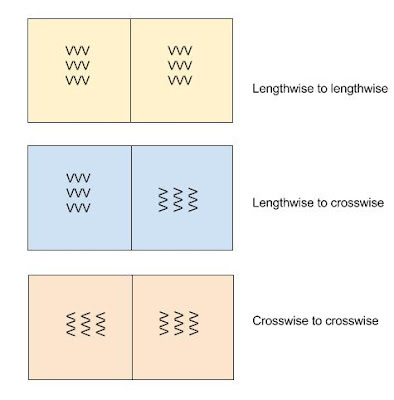 Crosswise to crosswise, as in sewing a hem band to the bottom of a sweater. Test each of these scenarios and note the stitch length, stitch width, and tension that yield the best seams. Sewing a set-in sleeve or a neckband requires sewing in all directions, including on the bias. I don't recommend changing settings partway through those seams unless the fabric is really, really, tricky! My advice, if you're new to sweater knits, is to take your time with basic elements to get them the way you like them. Then expand your skills at your own pace. Practice makes improvement! Below is a quick video from last Saturday's sewing #OnSaturdaysWeSewSweaters where I go through some of these steps for my current personal project, a cardigan in Washington Square wool. Not on the email list? 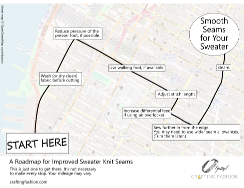 Subscribe and get the download A Roadmap for Improved Sweater Knit Seams.